ArtEngine runs in any web browser - no software to download. 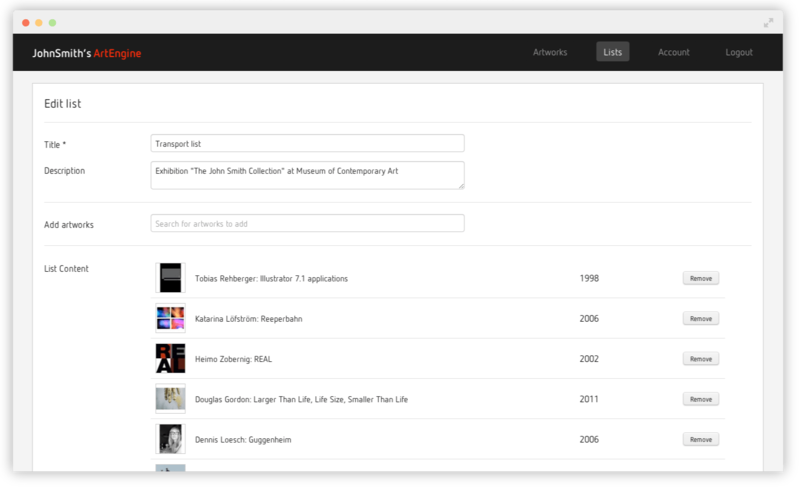 Intuitive design lets you view and manage your artworks clearly and easily. Easy access from all your devices. 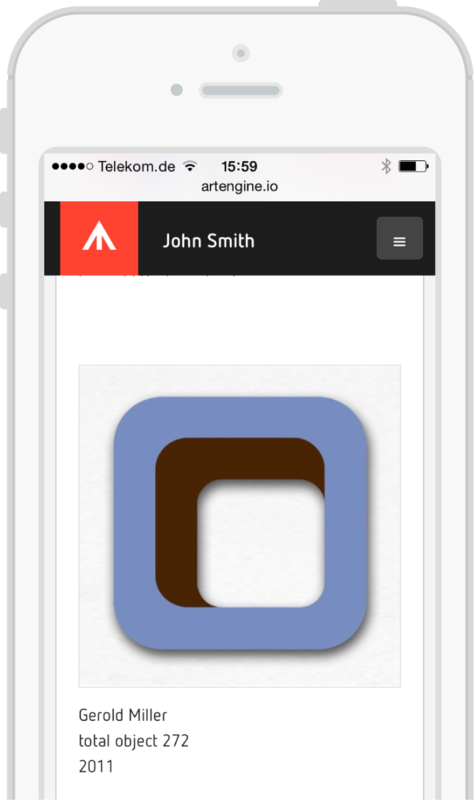 ArtEngine is fully responsive, so it looks great on desktop, notebook, tablet or mobile. Users can work simultaneously with multiple access. No more peering at puny thumbnails – with ArtEngine you can upload multiple high-res images up to 50 MB each, and add up to 5 different images per artwork. See where individual works are at all times, with added location details, exhibition history and owner info. Use tags to organize your work into specific, personalized categories. 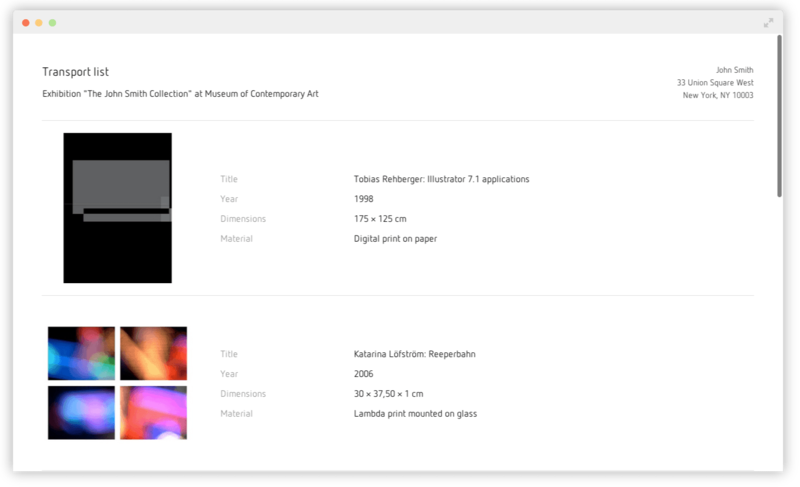 Create your own custom Tags to apply to each artwork – use any criteria you want to make sorting your collection quick and easy. 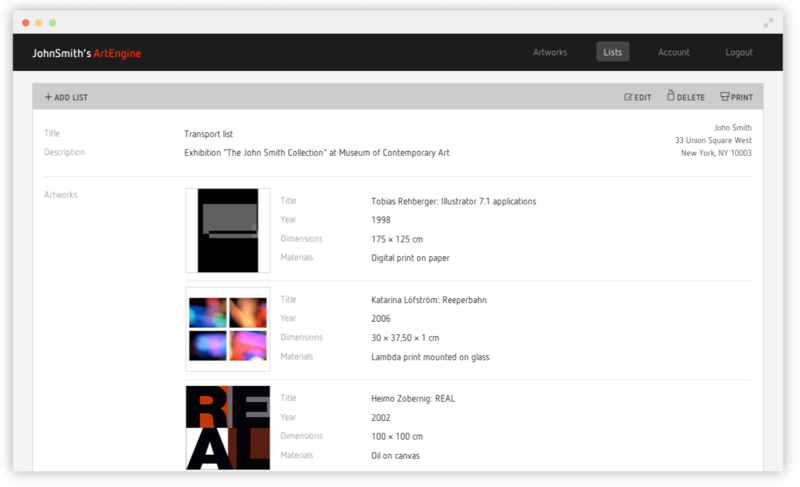 The in-built Search Engine let's you manage a large database of artworks and find what you want at the click of a button. Use the List Function to easily group and organize your artworks for exhibitions, transport & insurance purposes and more. Export your lists to PDF with a choice of beautiful layouts. Our customer support is on hand to help with any queries. Email your question and we’ll get back to you – fast! Email support is currently available during Central European business hours (9am – 5pm). Easily send artworks by email from ArtEngine – in just a few clicks you can share one or more works with an interested party, including images and work details. Sharing high-res images is easy. No more sluggish uploading to folders or re-sizing for file-sharing services... now you can simply send the other person a download link via ArtEngine. They’ll even get caption info attached too – ideal for press image requests. You can also setup a Showroom for specific works you want to share with friends and colleagues. Add as many works as you like and then send a Showroom link. One click at their end and they can view what you’ve shared in seconds! We use SSL Security to guarantee your private information stays private. Your artwork data is safely stored in ArtEngine's secure cloud storage, so you can access it from anywhere, any time. We regularly backup all our data to ensure you never lose anything, ever. We needed a system to store all the data for the Wemhöner Collection - the system we were using before to keep track of all the artworks was too complicated and not always available. ArtEngine’s been fun to work with and it’s way simpler to use. I love being able to see my work wherever I am, whenever I want. And in hi-resolution too - it looks great on my screen! No time for your inventory? We realise you may not have time to take care of your inventory - even if uploading artworks can be fun and even downright addictive! So why not let us do the work for you? Just get in touch by email and we can arrange for your artworks to be neatly organized in ArtEngine. Try ArtEngine free for 30 days. Cancel at any time. ArtEngine CEO Jan Winkelmann spoke to Monocle at Frieze Art Fair in London. ArtEngine was founded by Jan Winkelmann, who’s worked across different roles in the contemporary art world for more than 20 years. As a curator at Galerie für Zeitgenössische Kunst Leipzig, he was responsible for organizing breakthrough exhibitions from its opening in 1998 until 2003. This included a lineup of—the at time—emerging artists like Martin Eder, Olafur Eliasson, Michael Elmgreen & Ingar Dragset, and Tobias Rehberger. In 2003 he opened his own gallery in Berlin, participating over the years in international fairs such as Art Basel, Art Cologne, The Armory Show in New York, and Miami’s NADA Art Fair. 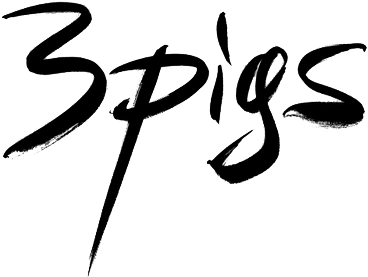 Then it was time for a new challenge—mobile and online art services. 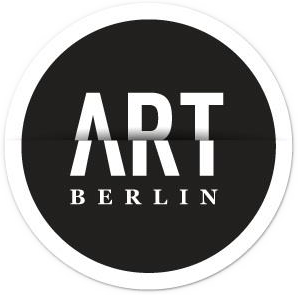 In 2010 he launched EYEOUT, a mobile art guide for Berlin that has grown into an international presence as Exhibitionary following a 2016 merger and subsequent renaming. Further exploring the intersection between art and digital technology Jan launched Amazing Editions in 2015. The platform offers a hand picked selection of limited editions by some of today's most exciting artists. Since 2014 Jan is running ArtEngine, a web-based inventory software for art collectors, artists and galleries. The contents of our pages have been created with the utmost care. However, we cannot guarantee the contents' accuracy, completeness or topicality. According to statutory provisions, we are still responsible for our own content on these web pages. In this context, please note that we are accordingly not obliged to monitor the transmitted or saved information of third parties, or investigate circumstances pointing to illegal activity. Our obligations to remove or block the use of information under generally applicable laws remain unaffected by this as per §§ 8 to 10 of the Telemedia Act (TMG). Thanks to PlaceIt for the product screenshots. ArtEngine is a cloud-based art inventory tool that makes managing your artworks easy and efficient. You can use it to keep track of your artwork's location, loan status and owner info as well as recording important details like materials and dimensions. You can create and export lists for transport, exhibition/insurance use and more. You can also add custom tags to organize your work into specific, personalized categories. ArtEngine runs in your web browser so there's no need to download any software. It looks great on any screen, and can be managed from your iPad/iPhone, smartphone, tablet or computer. Is there a free 30 day trial? You can create an ArtEngine account and try out all the features completely free of charge for 30 days. You won't need to submit any credit card information. When your free trial period is nearly over, we'll shoot you an email to see how you're getting on. Then it's your choice if you want to subscribe to one of our paid plans and continue using the app. You can upgrade your subscription any time during your 30 day free trial. We'll email you near the end of your trial to remind you when it's expiring. If you reach the end of your trial period without choosing a plan, your account will be put on hold until you choose a subscription or cancel your account. Your data and images will be stored safely in the ArtEngine cloud until you select a plan or cancel, so your artwork data will still be there when you next login. How much does it cost to use ArtEngine? 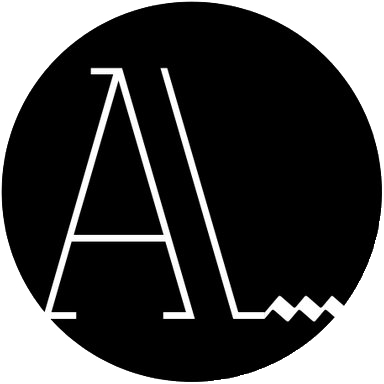 ArtEngine is a subscription based service. You can sign up for a 30 day free trial to try out all the app's features. Plans can be upgraded at any time, so you can easily manage a growing collection. Yes. Monthly subscriptions can be upgraded or downgraded at any time. Annual plans can be upgraded but not downgraded. Just email support@artengine.io and we'll get right on it. You can pay for any subscription plan using PayPal. If you don't have a PayPal account, no problem. We can send a regular bill that you can pay by wiretransfer. At present we don't have an automated payment solution implemented, but it's coming soon. You can cancel your subscription at any time, just email (support@artengine.io). If you decide to cancel your ArtEngine account, you would no longer have access to your artwork inventory data. Log in to ArtEngine and go to Artworks. Click on "Add artwork" and you'll see a page where you can add your first artwork. Tags a great tool for organizing your artworks. You can create your own unique tags and use them to define work groups, genres or whatever is important to you. For instance: "On loan" or "Sold 2013". You can upload up to five photos per artwork. And you can use high-res files of up to 50MB per image. You don't have to add everything in one session though. You can just start with your favourite works, your latest acquisition, or a forthcoming exhibition. You're in control. How to export individual works? You can send individual works by email, or export them into a PDF. How to send a high-res image? With ArtEngine you can upload 5 high-res images (up to 50 MB each) per artwork. You can also send these images to other people direct from the app – ideal for image requests. ArtEngine lists are useful for organising your artworks for exhibitions, transport and insurance purposes, as offers and more. Making a list is as easy as uploading an artwork. Just click on 'Lists' in the main menu, then choose 'Add list'. From the results you can create a list by clicking "Create list"
How to print or export a List into a PDF? Choose a list from your List menu and click "Export"
Once you've chosen your display fields, click "Export List" and a PDF will be generated and exported automatically to your download folder. Tags are ArtEngine's secret weapon... They make organising, searching for and displaying works in your inventory easy. You can define your own tags using any criteria you choose, and apply as many tags as you like to an artwork. Add tags for different work groups or materials: like "Prints", "Works on paper", "Installations" etc. Tag all works that were sold or acquired in a specific year: "Sold 2013", "Acquired 2014" etc. Tag works currently on loan to an institution or exhibition with "On loan at..."
Add tags for each work's location: "Beach house", "London apartment", "In storage" etc. Please note: your tags can be defined by free text, so there's no need to write_your_tags_like_this. Just add words separated by spaces, like in the examples above. How to use the showroom function? You can setup a showroom for works you want to share with friends and colleagues. Invite one or more people to view your collection privately. To share your showroom with others, simply click the Share button and add email recipients. You can include a message to introduce your showroom too. What are the technical requirements for using ArtEngine? ArtEngine is a cloud-based software which runs in your internet browser. So there's no need to download anything - just open your browser and go to artengine.io to start organizing your artworks. You can manage your inventory from your iPad/iPhone, smartphone, tablet or computer, and even get simultaneous access for multiple users. What support does ArtEngine provide? We provide full email support for Simple and Regular plan customers and will answer any question you have about using ArtEngine. Just email support@artengine.io and we'll get back to you as soon as possible. Email support is currently available during Central European business hours (9am - 5pm). For Professional and Custom plan customers we provide additional telephone support. Our support line number will be emailed to you after subscribing. Yes. We take your data security very seriously, so ArtEngine uses the most widely used security protocol, Secure Socket Layer (SSL). ArtEngine UG (haftungsbeschränkt) ("us", "we", or "our") operates the https://artengine.io website (the "Service"). This page informs you of our policies regarding the collection, use and disclosure of Personal Information when you use our Service. The security of your Personal Information is important to us. We never share your personal information with a third party. We may use your Personal Information to contact you with newsletters, marketing or promotional materials and other information that may be of interest to you. You may opt out of receiving any, or all, of these communications from us by following the unsubscribe link in any email we send. Our Service does not address anyone under the age of 14 (e.g. in Germany), respectively 13 (e.g. in USA) ("Children"). We do not knowingly collect personally identifiable information from Children. If you are a parent or guardian and you are aware that your Children has provided us with Personal Information, please contact us. If we discover that a Children has provided us with Personal Information, we will delete such information from our servers immediately. We provide full email support and will answer any question you have about using ArtEngine.